new disks fall into the backup with incremental backups. Previously, this happened only when creating a full backup. New Vembu BDR Suite 4.0 functionality in Microsoft Hyper-V clustered scenarios will be discussed in the webinar: Are your servers Highly Available? 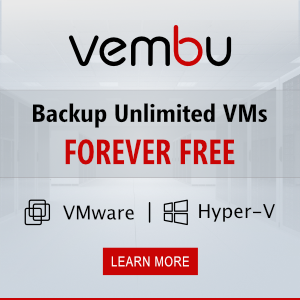 You can Register for this upcoming live webinar from Vembu: Vembu extends support to Hyper-V Cluster with 4.0. Key functionalities up with v4.0. November 28, Wednesday at 11:00 AM GST, 12:30 PM IST, 3:00 PM SGT – for APAC. The official release date is still unknown, but version 4.0 is expected this month. Further information about the Vembu BDR Suite can be found on the Vembu website.